Comfortable Tipi accommodation adjacent to lovely Rathsallagh Golf & Country Club in peaceful country setting with beautiful surroundings. Set in 250 acres of parkland, close to the Kildare/Wicklow border is only 40 minutes from Dublin’s M50. Take the stress out of camping and come and experience Rathsallagh Tipi Village with family or friends. No hassle erecting a tent or packing away a wet one! No need to fork out on expensive camping equipment. Our Tipis are equipped with everything you need to enjoy an authentic camping experience. The site can accommodate 50 people and group bookings, or exclusive hire, are possible. 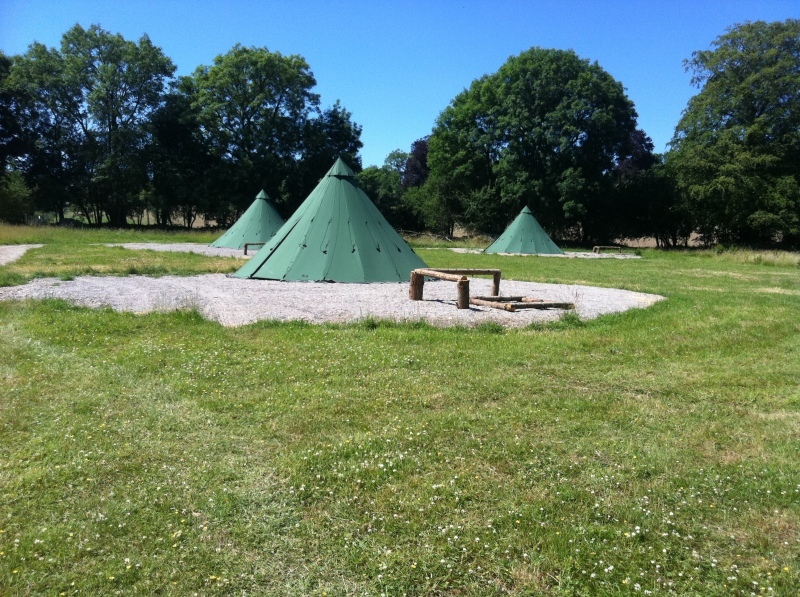 Our Tipis are modern single pole canvas structures that are six metres in diameter. These are strong structures providing ample space and protection from the elements. Each Tipi accommodates 6 people on a pallet beds or 10 in sleeping bags; a 10cm camping mattress and a 3-season sleeping bag is provided. There is interior LED lighting, floor covering and a table and chairs. Also included are paraffin lanterns, 2 cast iron cooking pots for fire pit cooking, cooking utensils and washing up equipment. Each Tipi has its own fire pit with log seating. The Campsite also has a well-equipped communal entertainment and outdoor kitchen area. There are 2 portaloos on the site and one additional permanent loo for those needing a little more comfort! The site is located next to a small river but if you would prefer a hot shower, you can use the facilities at the golf club (5 minutes’ walk from the campsite) by prior arrangement. Please note towels are not included and there is NO camping electric hook up. We have a caretaker on call for your convenience. Please enquire when booking about golf packages, family days or bush craft activities*.